Perry Ellis International, Inc. is a leading designer, distributor, and licensor of a broad line of high-quality men's and women's apparel, accessories and fragrances. The Company's collection of dress and casual shirts, golf sportswear, sweaters, dress pants, casual pants and shorts, jeans wear, active wear, dresses and men's and women's swimwear is available through all major levels of retail distribution. Perry Ellis International asked ONPEAK Energy to asses and proposed an energy savings solution that would allow the corporation to be more sustainable and help with the reduction in emissions by implementing some changes to the assets they manage. In the case of their Jantzen Inc, Seneca Facility, existing lighting systems consisted of thousands of eight foot T12 fluorescent tubes which were burning at a rate of 2 dozen tubes per week, keeping their maintenance staff dedicated to replacing tubes every week, besides being a very inefficient technology. ONPEAK Energy is a Florida-based Efficiency Consultancy Company that works with building owners to evaluate, install, and help finance investments in energy-saving equipment. To assist Perry Ellis, ONPEAK proposed doing a complete LED retrofit at the facility. ONPEAK implemented a turnkey solution with an impressive payback (less than a year) collecting not only a large rebate from the local utility company. ONPEAK retrofitted two complete warehouses in the industrial compound, including parking areas, offices, picking areas, distribution centers, offices, storage and loading docks. In the main storage area ONPEAK also proposed, given the age of the property and the condition of the old cloth covered wiring, to replace the existing installation with new wiring and panels, which not only make the property safer but also since the panels were resized, the energy demand costs dropped for this particular area. Over 4,500 T12 lamps were replaced with more than 9,000 LED T8 tubes adequately retrofitted to meet UL specifications and assure the safety of the working environment. Additionally, 400 2x4 troffer lights in the office areas were also retrofitted to LED. In the loading area, we proposed and installed HB lighting to improve the light conditions of the facility. The solution was designed to save energy and maintenance expenses, as well as to qualify to Duke Energy’s rebate program. We also worked with ETS to get Perry Ellis International an R&M dollar-per-dollar tax deduction on all the material an labor cost that took place to remove T12 lighting from the property. 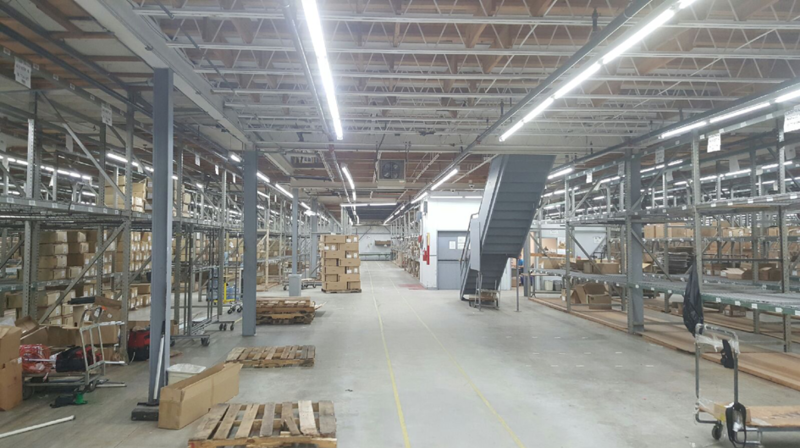 With the newly installed LED lighting system, which includes a five-year warranty, Perry Ellis assures all the safety requirements needs to meet their operational standards and is saving over $86,000k every year in maintenance and power savings. The new LED lighting system improved the quality of lighting by more than of 40% (average) in all areas of the facility. The project qualified and collected a $104,000.00 rebate from Duke Energy and we were able to qualify and certify 179D and Repair and maintenance deduction for Perry Ellis International of $72,373.00 and $102,436.00 respectively. With all the savings and incentives combined, the project had an impressive payback of less than 10 months.